“Quality is not an act, it is a habit.” – Aristotle. 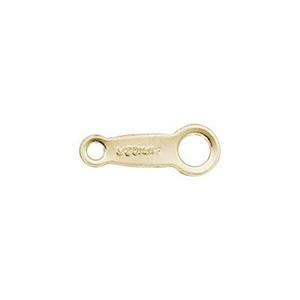 Our GF378 – 14/20 Yellow Gold-Filled Quality Hallmark Tag for finishing chains. Already stamped with 1/20 14KT for you! The small ring has a .9mm Inside Diameter Ring that will accommodate a 20 Gauge or Thinner Jump Ring to add to one end of your 14/20 Gold-Filled Footage Chain and you will use the other larger 1.8mm Inner Diameter Ring of the Quality tag to clip your Jump Ring into. Notes: Item is stamped with "1/20 14KT"